You know, sometimes we just "know the answer". And yet, we want proof. Take the whole omnichannel movement, for instance. Everywhere you look, we're told that you have to be omnichannel, or you're "dead". Apple completely ignores social, and they steamroll the competition. Amazon didn't choose the catalog marketing path, and destroyed catalogers in the process. How is that possible when catalogers had a "multi-channel edge" over Amazon? Best Buy has a major competitive advantage with stores, and yet, customers willingly choose to buy elsewhere - from businesses that do not have stores (Amazon). Why would a customer ever buy from Amazon when the same merchandise is available in a Best Buy store and on the Best Buy website at the same price - wouldn't the power of omnichannel trump Amazon? When you question omnichannel strategies, you get that stale, blank stare that confirms you are an idiot! Except, almost no businesses that are lauded as omnichannel pioneers experience breakthrough sales. I know, I know, there's John Lewis in the UK, they're all about omnichannel ... except, of course, that while everybody cheers them on, they grow at a compound annual rate of 6% (click here). In other words, the best level of omnichannel performance cited by the experts is double the rate of inflation. #Omnichannel! And Macy's, "America's Omnichannel Store" as they call themselves, is growing at just over 2% over the past seven years, +/- the rate of inflation. That's what you get for being omnichannel? Meanwhile, Amazon, without the bricks 'n clicks advantage, without catalogs to boost sales, quadrupled sales in the past six years. We have decided, for no good reason whatsoever, that omnichannel is the secret sauce that fuels our ecosystem. There isn't evidence (sales) that omnichannel trumps a sound merchandising strategy. Why don't we simply provide a great shopping experience complete with outstanding merchandise that customers must have, merchandise that cannot be found elsewhere? Oh, that's hard to do? Alright. Sometimes, we already know the answer. We just want to believe that we're doing something important - "it's not our fault". Read the comic above. 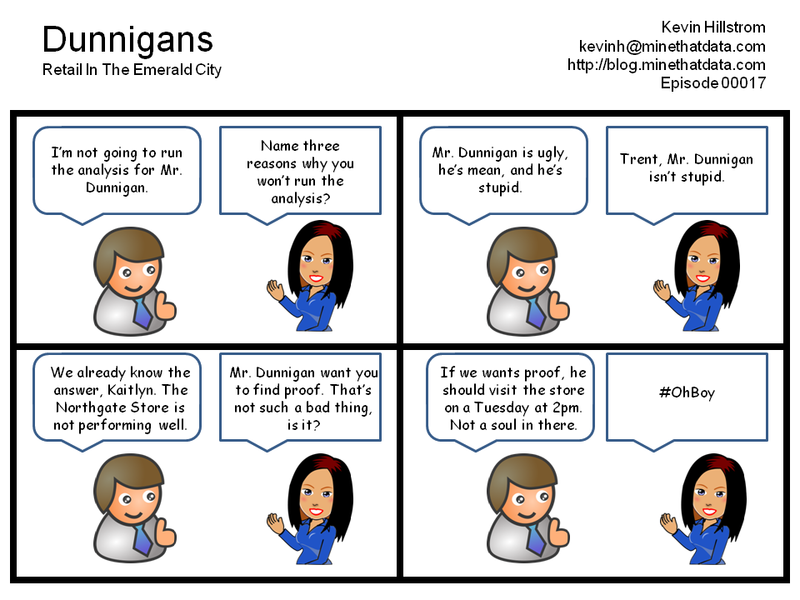 The store isn't working, nobody is shopping in it, and yet, the owner wants to perform an analysis. Sometimes somebody just needs to stand up, to "step up", and state the obvious. Sometimes, we know the answer.